Raith Rovers manager Barry Smith believes he has upgraded his striking options after snaring Chris Duggan from local rivals East Fife. The Australian finalised his move from Bayview this week, with the contract paperwork completed via email due to the 24-year-old currently spending the close season in his homeland. After fending off interest from elsewhere, Smith is delighted to have secured the signature of the striker who bagged 15 goals in League One last season for the Methil men. “I worked with Chris at East Fife for half a season and having watched him a few times the season past, he certanly brings a better dimension to what we’ve got here,” Smith said. “He brings everything to the table. “He’s strong, he scores goals, and has good link-up in terms of holding the ball up and getting in the box to score goals. “He scores lots of different types of goal and given the opportunity he’s capable of spectacular strikes. Duggan started his career in the U20s at Partick Thistle and despite failing to make the first team at Firhill, he has since become a proven goalscorer at lower league level, particularly at his previous two clubs, Queen’s Park and East Fife. Smith, however, reckons his new recruit has the potential to become even more prolific at the Kirkcaldy club. “Fifteen goals last season is a good return for having largely played as a sole striker,” he said. “Hopefully we’ll create a lot more chances, which will boost his goal return. “He’s been brought up through the Partick Thistle system so he has got a good background, coached well, and had a couple of seasons finding his feet again. 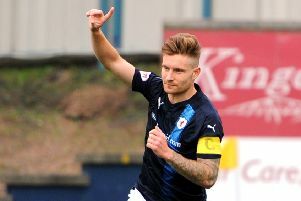 Duggan’s form at Bayview attracted interest from rival clubs, however the forward showed a willingess to join up with his former boss at Stark’s Park. Duggan will join Liam Buchanan and Lewis Vaughan, who were already under contract, in the competition for places up front next season.